Available: From level 7. No restrictions. 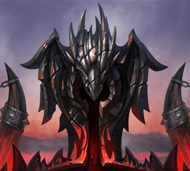 Description: The great dragons are superbeings that have been created by Sheara to embody the power of their race. Everyone who wants to can dedicate their life to the great dragon by offering goods to it. Every player who offers sufficient goods to one of the dragons will receive Great Dragon Amulet. The amulet will significantly increase the chances of being visited and supported at least once during the time of the active bless (after using the amulet). From having received the Medal of Recognition you also have the chance of being visited randomly by your dragon. The dragons accept various resources from Faeo as offers. The more resources your offer to the dragons the higher is the chance that you will get their protection and that your reputation will rise. You can increase your reputation using Spark of the Heavenly Fires. You can hand it to the NPC who ititiated you to the reputation. 1 spark will give you 150 reputation points. Great Dragons Pack of Cards: Once a week the dragons will provide their favour, according to the blessing of the red medal. In addition, Great Dragons Pack of Cards and the Medal of Worship provide the opportunity to receive Great Dragon Standard. With an increasing Great dragons Reputation your chances increase that the dragon will help you in battles and the stronger are the effects the dragon will use to help you.